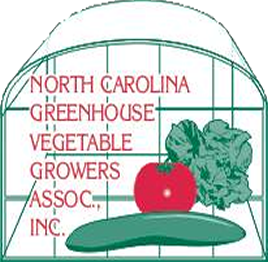 The North Carolina Greenhouse Vegetables Growers Association and NCDA&CS will co-sponsor two NC Greenhouse Vegetable Event Days to celebrate the arrival of fresh, local NC Greenhouse Vegetables in April of 2019. 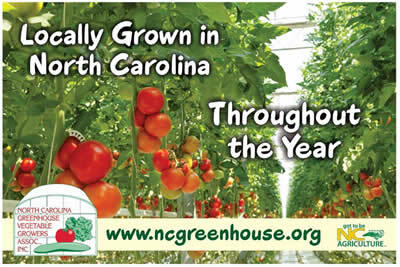 Come out and enjoy a “free” NC Greenhouse Tomato Sandwich and visit the NC Greenhouse Growers on the markets to find fresh, local North Carolina Greenhouse Vegetable such as tomatoes, lettuce, cucumbers and peppers! Enjoy fresh, local vegetables ahead of the traditional growing season! BIG FUN AT THE FARMERS MARKET! 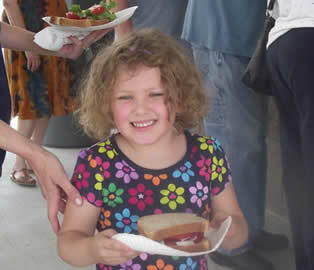 WE had great fun at the Farmers Markets in Raleigh and Colfax, NC on specific days this summer See the photos here!! CLICK HERE TO FIND THE FRESHEST GREENHOUSE TOMATOES TODAY! For almost 40 years the Association has been proud to promote and delevop all phases of the greenhouse vegetables industry, providing it's members a voice to help develop state agricultural policy through theHorticultural Council and NC Farm Bureau. We provide our members the opportunity to communicate with other growers, building knowledge and strength in the industry, helping with NCDA and CS Marketing Assitance. The North Carolina Greenhouse Vegetable Growers Association is also leading the way in industry research on areas such as breeding, growing and pest management, application of research pertaining to production,sanitation and marketing, and sponsor shows, sales, exhibitors and contests. We would love to welcome you as a new member, Please feel free to look around this site, and if you would like to join us, click here. Do you know where tomatoes originate from? Italy? Egypt? Or Deepest Darkest Peru?